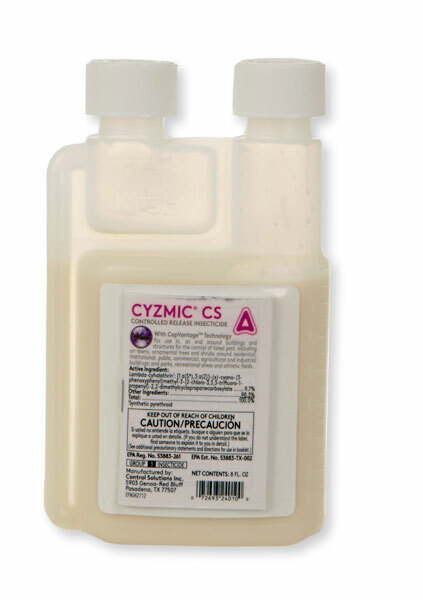 Cyzmic CS contains the same ingredient as Demand CS. The difference being that Cyzmic CS is considered by some to be a generic form. Demand CS would be the name brand of Lambda Cyhalothrin. Both are microencapsulated and give a fairly long residual. I am surprised that you are not getting control. Depending on the species of centipede and where they are actually propagating from, you may not be treating the correct area. Also, if there is substantial leaf clutter under shrubs, etc, then that could provide harborage, and if you are only spraying over the top of it, then it may not even be contacting them. Instead of changing products, I would recommend to evaluate where they are coming from. Centipedes are an outdoor pest, they seldom infest indoors. So the outdoor treatment is essential, and treating where they are living is essential for control. If you are only treating indoors, then I would suggest to quit spraying indoors and start spraying the outer perimeter, into cracks, weepholes, under shrubs, etc. Indoors consider using ePest IPM Sticky Traps to capture them. This way, you keep your indoor spraying to a minimum and hit them where the originate - outdoors.